Posted October 11, 2014 by Dan Weisberg & filed under Archives. President/CEO – Rockland Economic Development Corp. The discussion will focus on our transportation network; roads, rails, and mass transit along with the changing face of Rockland and the influence on economic development. Where are we now and what do we need to do in order to encourage and sustain growth in the area. This event is open to the public. 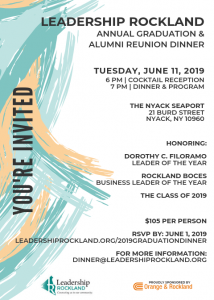 Please share this email with your contacts and anyone you think is a potential candidate for the Leadership Rockland program.